First flowers of Crinum bulbispermum. Since moving to the South many years ago, I’ve always been fond of crinums (pronounced “CRY-nums”) or swamp lilies. In my travels across the state I’ve seen them in gardens, cemeteries, old home sites, and roadside ditches. In the spring bold green leaves sprout from underground bulbs (some attain the size of grapefruits) to create a fountainlike haystack of straplike leaves. 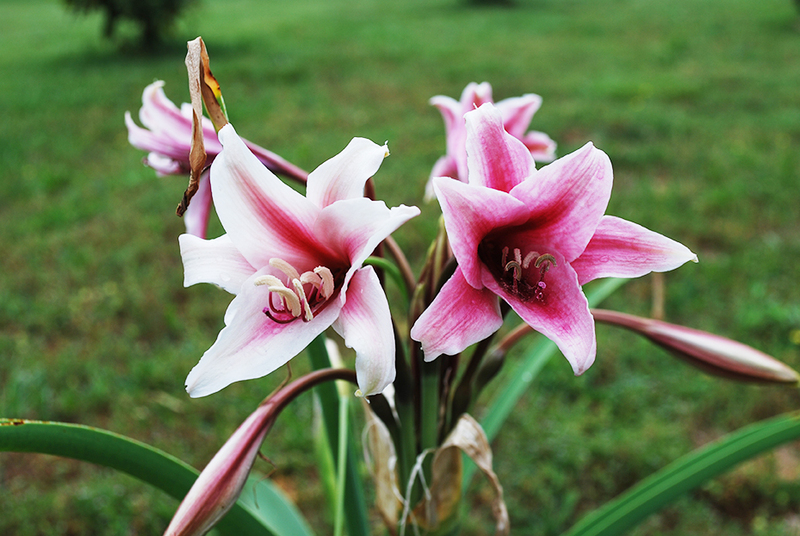 In the summer clusters of lilylike flowers appear on three foot tall stalks in colors that range from white, pink, or striped (“milk and wine lilies”). Several common varieties include ‘Ellen Bosanquet’ (red), ‘Cecil Houdyshel’ (deep pink to red), and C. x powellii ‘Album (white). The Orange River lily (C. bulbispermum) is well-suited for wet areas (“hog wallows”); it’s flowering now in my garden (pictured) and will bloom sporadically though the summer and fall with white, pink or striped flowers. Closeup of Crinum bulbispermum flower. 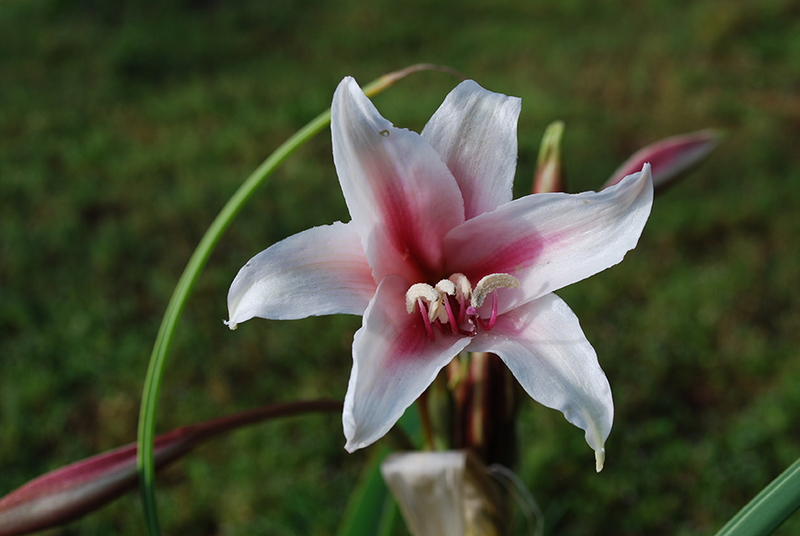 Beauty and durability: isn’t it time you added a crinum to your landscape? Right now, continue to enjoy their pure white fragrant flowers indoors. They should be resting near a window that receives bright, indirect sunlight. Keep the potting medium moist. Water the plant thoroughly when the soil surface feels dry, but avoid overwatering. If the pot is wrapped in decorative foil, be careful not to let the plant sit in trapped, standing water. Remove the plant from decorative pots or covers and water until it seeps out of the pot’s drain holes. Repeat this several times. Allow the plant to drain for a few minutes before putting it back into its decorative cover. When a mature flower starts to fade and wither, cut it off to keep the plant looking attractive. Prepare a well-drained garden bed in a sunny location amended with organic matter such as compost. Good drainage is the key for success with lilies. To ensure adequate drainage, create a raised garden bed by moving soil to the top a few inches higher than the surrounding soil level. Also, adjust the soil pH to 6.5 to 7.0. Plant the potted Easter lily bulbs 12 to 18 inches apart. Water them in immediately after planting. Lilies like their “feet in the shade and their heads in the sun.” Mulch with a 2-inch layer of compost, pine straw, or shredded leaves. This helps conserve moisture in between waterings, suppresses weed growth, keeps the soil cool, and provides nutrients as it decays. 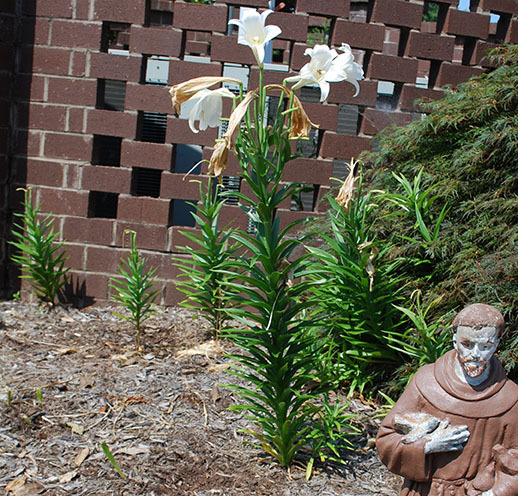 Easter lily in bloom on June 22, 2014 in Easley, SC. As the leaves and stems of the original plants begin to turn brown and die back, cut them back just above a healthy leaf on the stem. Wait until the leaves and stems have turned brown before removing them. New growth will soon emerge. In the fall when the lily stalks have matured and turned yellow, you can cut them back to soil level. When they are completely dry, the stalks can be pulled out easily. During the winter months, maintain a generous layer of mulch. Carefully remove the mulch in the spring to allow new shoots to come up. Fertilize with a complete fast-release fertilizer such as 8-8-8 when the new shoots emerge and monthly until flowering. Conversely, a slow-release fertilizer can be applied just once during the growing season when new shoots emerge in the spring. Apply the fertilizer to the soil around each plant about 2 inches from the stem and water it in. Easter lilies, which were forced to flower under controlled greenhouse conditions on Easter, a holiday that can fall on any Sunday from March 22 to April 25, will flower naturally in late May and June and will reach a height of 3 feet or more. Although your recycled Easter lilies will not bloom on time, you can still enjoy their elegant flowers and take credit for their spectacular display. Easter lily (Lilium longiflorum var. eximium) grove in Piedmont, SC on June 22, 2014. 1. Prepare a well-drained garden bed in a sunny location amended with organic matter such as compost. Good drainage is the key for success with lilies. To ensure adequate drainage, create a raised garden bed by moving soil to the top a few inches higher than the surrounding soil level. Also, adjust the soil pH to 6.5 to 7.0. Easter lily (Lilium longiflorum var. eximium) on June 22, 2014 in Piedmont, SC. 3. Lilies like their “feet in the shade and their heads in the sun.” Mulch with a 2-inch layer of compost, pine straw, or shredded leaves. This helps conserve moisture in between waterings, suppresses weed growth, keeps the soil cool, and provides nutrients as it decays. Easter lilies, which were forced to flower under controlled greenhouse conditions on Easter, a holiday that can fall on any Sunday from March 22 to April 25, will flower naturally in late May and will reach a height of 3 feet or more.